Today's case comes to us from one of my colleagues and classmates, Kathryn Deterding, ATC. Kathryn consulted with me about this case and then went on to implement a treatment protocol based off our discussion. 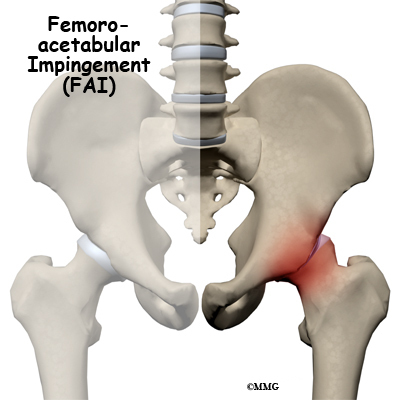 A Case of Bilateral Femoral Acetabular Impingement(FAI) and Labral Tears in a Collegiate Soccer Player. History: This was a 21 year old male collegiate soccer player. In the fall of 2011 he began to experience hip pain that he played through. In the upcoming spring of 2012 he was diagnosed with bilateral FAI and tried to rehabilitate his injury to prepare for the fall season of 2012. The fall season was just as painful as the previous season. This athlete then underwent two different surgical procedures in the winter of 2012. One for each hip, in attempt to lessen his FAI and correct additional labral tears of the hip. The athlete had minimal rehab for a month or so after his surgeries and refrained from heavy activity for a few months. Upon increasing activity to prepare for the fall 2013 season of soccer the athlete began to experience the same pain and symptoms. He consulted with an orthopaedic surgeon during the preseason and the physician told him that he may not see any improvements and that this was something that he most likely was going to have to live with. It was at this point that Kathryn and I discussed the athlete's case together and came up with a plan of care. The first thing that I did was discuss thought viruses with the athlete and talked about how current neuroscience is teaching us that pain is not necessarily patho-anatomically based but is a construct of the central nervous system. The athlete admitted to thinking that all of this discussion was a load of hogwash and didn't buy into any of what I said. Nevertheless, we continued on with our plan of care. Can Edge Mobility Bands Really Improve Mobility? Let Us Investigate. Sorry for the delay in posts everybody! I have been busy with a combination of work, working on my thesis, and pre-season football practices. Enough complaining...lets get to the post! I recently got myself a few new toys to use in the clinic when I bought myself a pair of Edge Mobility Bands from The Edge Mobility System. I am in the process of experimenting more with these bands so I can write an extensive and fair review of them to publish here. Nevertheless, I have already started to find them handy and beneficial when treating my athletes. I have been using them with great success to increase mobility and decrease pain of a few football players that have been complaining of persistent and chronic knee pain. In particular, I have been using them to increase hip internal rotation mobility and I made a video to showcase this technique with the help of some of the athletic training students that are assigned to me. The student I use in this video also used to be a football player (kicker) in college and is normally restricted with Right (kicking leg) Hip IR especially compared to his Left leg. I learned this technique from a video made by the owner of the Edge Mobility System products and the author of TheManualTherapist.com, Dr. Erson Religioso, DPT. You can find his original video and post of this mobilization here. ...Enough jabbering on my part, here is the video. I hope you enjoy it and I can't wait to show you all more! Two Exercises I Do Before Every Run: My First Video Post! Hey everyone, I was about to go for a run today and I thought of the idea of highlighting some of repeated-end range exercises that I have mentioned in some of my recent posts. Today I will show you two of them that I do try to do before every one of my runs. I learned these from Dr. Erson of TheManualTherapist.com so I can't take credit for thinking of them! I must say that incorporating these two exercises has helped me resolve any lingering heel stiffness/pain that I previously had. It is very easy to find out if these will do anything for you by giving them a try and checking your mobility to see if benefit from them. If you do, great! If not, you might want to try some soft tissue to assist you reach your true end range or maybe just find something that does work for you! Swinging an object like a club, baseball bat or golf club. Limitations in hip extension or gluteus maximus activation can also affect static postures like standing by influencing pelvic tilt, motor control activation strategies, lumbar curve and ultimately the body's center of gravity. For more reasons on why "running is all in the hips", see James Dunne's great post, here.